French onion grilled cheese is my love language. 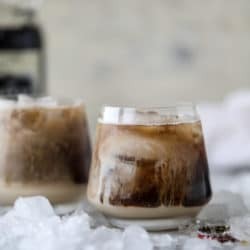 I’m sharing the very first recipe from The Pretty Dish today and eeeeep, let’s talk about it. It’s freaking DELISH. It’s cheesy. And caramelized oniony. And toasty and golden and buttery! I write about this in the book, but when I was a kid, I was obsessed with ordering French onion soup for the bread and cheese alone. I mean, I would even touch the onions. My mom would get so annoyed and tell me that I couldn’t order it if I didn’t eat the actual soup… and I’d end up failing every time. Just that melty cheese that blankets the bowl in a warm hug was enough for me to beg for that darn soup. Not a ton has changed since I’m clearly still very enticed by the bread and the cheese. If I’m being real, its probably my main motivation for ordering said soup. But! These days I eat all of the caramelized onions too. And all the broth. But the bread and cheese… ooomph. 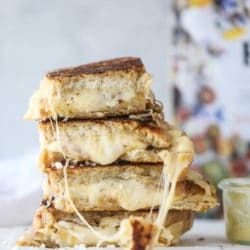 This French onion grilled cheese is a little play on that! Onions that caramelize FOREVER (seriously, for like 40 minutes or more) and then get shoved between gruyere cheese which is to die for. The golden, toasty, buttery bread is spread with thyme butter and I pretty much want a vat of that in my fridge at all times now. It’s SO good. The recipe calls for fresh thyme, but I had a tricky time finding it this time of year. Weird, because I can find every other herb! I subbed in dried thyme and it was still super. You can see a video of me making this baby below! It’s blowing my mind that The Pretty Dish will be out in almost one month. I AM SO IN LOVE WITH THIS BOOK! I can’t even explain how much I love it. How amazing the recipes are. How wonderful it looks inside. It’s just the best! You can preorder right now and the book will be in your hands on March 20th. I would love you forever. Also! Almost every single recipe in the book can be made in 60 minutes or less (with most even being 30 minutes or less) – and it is recipes like this one (and some slow cooker options!) that push the limit a bit. You don’t HAVE to take a full 45 or 60 minutes to truly caramelize the onions if you don’t have time. You can always even toss in some brown sugar and have them nice and caramely in 20 minutes! Then maybe stand over the pan and eat them with a fork. Now there is zero reason not to make this. Heat a large pot over low heat and add the butter. Once melted, add the onions, thyme and salt, stirring well. Cook, stirring occasionally, until the onions are golden and caramelized. This will take a full 30 to 40 minutes - or longer! Heat a large skillet over medium heat. Spread the outsides of the bread with the thyme butter. Top one side with the grated cheese, then a spoonful of the caramelized onions. Top with the rest of the cheese and other slice of bread. Repeat with remaining bread and ingredients. Stir the ingredients together in a bowl. This keeps great in the fridge! Can’t I just live inside there? I can’t wait for the book!! Preordered! OMIGOD can I just say thank you for a twist on grilled cheese that can still actually be called a “grilled cheese”. Thyme butter, such a great idea, and so simple. Excited to get my hands on your book! OMGOMGOMG! Screw chocolates on Valentine’s Day…I want this! these look so freaking delicious!!!! Omg! you are killing me with this! Amazing, no other words. Question re: Thyme. Usually there’s a different ratio fresh to dry. (I think it’s less for dry – but I always forget if it’s less or more) You note 1-1/4t for fresh What is the measurement for dry since a “pinch” can vary depending on who’s pinching. yes! definitely less for dry. i’d start with 1/8 of a teaspoon and go from there! OMG I so need to try this in my camping panini press. Will report back! Made it last weekend in our camping panini press. So good! I’m doing it again on our camping trip this weekend! I made these last night and can I just say this was the best thing I’ve eaten in my entire life!! Seriously so freaking good. Thank you for this recipe!! Made this as soon as I saw the post on Instagram. It was absolutely delicious. My husband and I devoured it. Rich but somehow not too heavy! The carmelized onions were worth the wait in cook time :) thank you for the easy recipe ! I will leave you with a quote from my husband after he ate this. “I don’t ever want this sanwhich to end, because then I will be sad”. It was that good. Cookbook pre ordered!! Thank you. I did make it, I had to adjust the thyme butter a bit [that’s just me]. But the others I made it for were perfectly content with the entire sandwich. Thank you. Shared. I think I missed something…but how did you manage 16 servings with only 4 slices of bread? Anyhow, I caramelize onions in my crock pot (all day, on low, with a bunch of butter & fresh herbs from the garden [thyme, sage, & rosemary] and put some crisp bacon inside this yummy sammie!